On Sunday, January 10th, 2010 over 5,000 people took off their pants on subways in 44 cities around the world. In New York, the 9th Annual No Pants! Subway Ride had over 3,000 participants, spread out over six meeting points and ten subway lines. HD video won’t play? Watch on it on YouTube. On Saturday, January 10th, 2009 nearly 2,500 people took off their pants on subways in 22 cities around the world. In New York’s 8th Annual No Pants! Subway Ride, Improv Everywhere had over 1,200 participants, spread out over four subway lines. Check out the IE site for tons of photos, including one photo from each of the regional rides around the world. Improv Everywhere has posted a save-the-date for their 8th Annual No Pants! Subway Ride in New York City. The event will take place on Saturday, January 10. 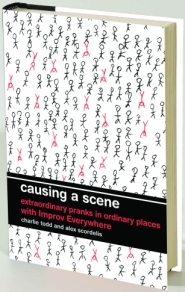 Urban Prankster organizations in cities around the world are encouraged to stage their own rides as well.